In case of an attempt to run a DTP process it ends with an error “instance DUMMY_NO_REQ_CREATED” there are following cases possible that might went wrong. 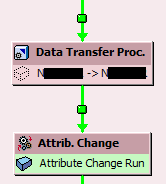 This error can be recognizable with Process Chain of its log view. The DTP process looks like it is disable, not green neither red. Simply it didn’t run. Resolution in most cases is reactivating or re-transporting corresponding TRFN. While using t-code SM66 I observed that in almost every time I enter in there I see some process running associated with ABAP class CL_SERVER_INFO. This was in SAP NW 74 ABAP stack based system. Depending on the kernel version there might be ABAP report SAPLTHFB displayed instead of the class. The class / report are used here to collect the work process information from all the instances of a system. It normal behavior of the ABAP system for a dialog work process of particular user logged into the system. In older version of the SM66 t-code (in newer releases called SM66_OLD) there is an option to hide these work processes does. In the new SM66 this options is not there.